It’s revival time. 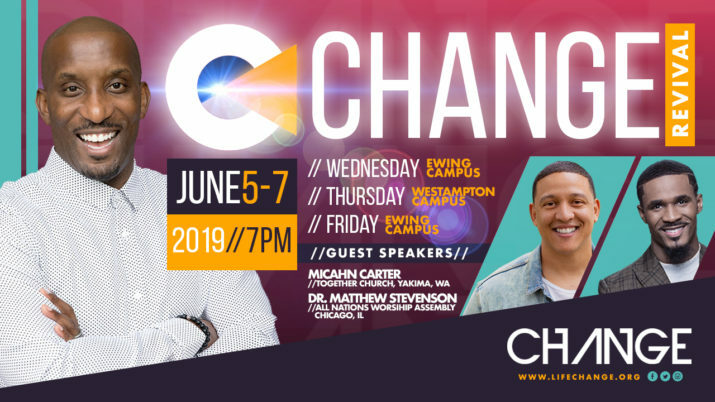 June 5th – 7th at 7pm we have 3 nights of Revival at the Change Conference 2019. On Wednesday, June 5th at our Ewing Campus, Pastor Dharius Daniels will kick off. On Thursday, June 6th at our Westampton Campus, Pastor Micahn Carter from Together Church will be our guest speaker. On Friday, June 7th we will conclude with Dr. Matthew Stevenson from All Nations Worship Assembly. You don’t want to miss these 3 nights. Spread the word and invite your friends to come experience the Change Conference 2019. Our mission is to help as many people as possible change their lives for God’s glory and their good.